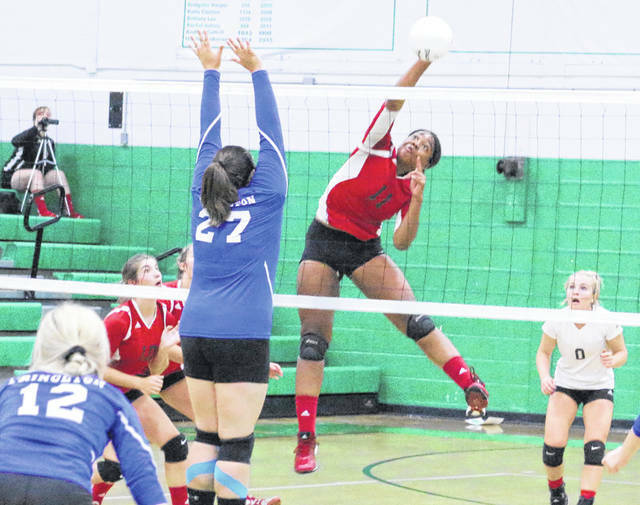 Point Pleasant senior Lanea Cochran (11) hits a spike attempt during a Sept. 13 volleyball contest against Princeton at Winfield High School in Winfield, W.Va.
POINT PLEASANT, W.Va. — Senior Lanea Cochran was the lone Point Pleasant player named to the 2018 West Virginia Sports Writers Association Class AA All-State volleyball team, as voted on by members of the WVSWA. Cochran — who was a honorable mention selection a year ago — was named to the first team after helping the Lady Knights to a program-best 26-5 record this fall. Cochran — a middle hitter — came up with 305 kills, 91 aces and 48 blocks on the season. Cochran also had a .297 hitting efficiency. McKenzie Carpenter of Philip Barbour was named the first team captain, while Gracie Mann of James Monroe was the second team captain. McKenzie Carpenter, Philip Barbour (CAPTAIN); Kristen Crowder, Bridgeport; Anna Hamilton, Nicholas County; Payton Hefner, Bridgeport; Hannah Rogers, Oak Glen; Savannah Bragg, Independence; Jyra Clark Casto, Philip Barbour; Jordan Irving, Frankfort; Hayley Swiger, Robert C. Byrd; Lanea Cochran, Point Pleasant. Gracie Mann, James Monroe (CAPTAIN); Kendall Hill, Winfield; Mykal Daniel, Independence; Olivia Barnett, Shady Spring; Shea Hefner, Bridgeport; Sierra Strickland, Roane County; Seanna Stump, Lewis County; Brooklyn Cook, Shady Spring; Abby Wetzel, Robert C. Byrd; Olivia Stear, Nicholas County. Maddy Jones, Philip Barbour; Rachel LeRose, Nicholas County; Kayla Grose, Frankfort; Trinity McDonald, Nitro; Laken McKinney, PikeView; Bradlea Hayhurst, Shady Spring; Alexis Bolen, Independence; Payton Merica, Bridgeport; Maddie Cooper, Herbert Hoover; Maggie Gadomski, Nicholas County; Emilea Holcomb, Clay County; Destiny Blankenship, Independence; Jadyn Hissam, Oak Glen; Emily Reed, Winfield; Chloe Puffinburger, Frankfort. Kiara Magnone, Weir; Kaylee Blair, Chapmanville; Madie Meade, Man; Hannah Davis, Robert C. Byrd; Bianca Blankenship, River View; Kaelyn Kesner, Keyser; Whitney Samson, Wayne; Esten Clay, Winfield; Chloe Hatfield, Westside; Anna Tucker, Lewis County; Morgan Marty, Liberty (Raleigh); Courtney Bevins, Clay County; Madison Shepherd, Shady Spring; Jordan Phillips, Poca.